Osteoporosis is a very common condition among postmenopausal women. This bone disease can develop over time for many different reasons and can be a painful experience. This is because your bones lose density and become weaker, which can cause frequent fractures from even the slightest impact. 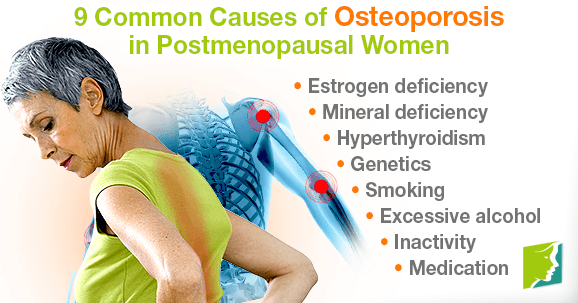 The majority of people affected by osteoporosis are menopausal or post-menopausal women. This is because their estrogen levels dramatically reduce. This causes a rapid decrease in bone density. This is why it's very important to identify hormonal imbalance to help prevent and treat osteoporosis. You probably already know that calcium is essential for strong bones. Getting this mineral is essential, but equally essential (yet less noted) is magnesium. Without magnesium, calcium cannot be absorbed in the body, instead it will be released through your urinary tract. Vitamin D and vitamin K are also essential for proper absorption of calcium in the body. You can eat all the calcium-dense foods you want but with D and K, again, it will not be retained in the body. In general these vitamins are also great for the building and maintaining of your bones. Read more about vitamins and supplements for osteoporosis. Hyperthyroidism is common among menopausal women and is when your thyroid produces too many hormones. The high levels, over time, can weaken the bones. If you have a family history of osteoporosis it can increase your risk for the disease. Make sure to find out if you have family history of this condition and respond accordingly. Studies on smokers have shown that they have weaker bones and a higher likelihood of fracture. The toxins in the cigarette block the proper function of estrogen, calcium, and vitamin D in the body. Alcohol can disrupt healthy building of the bones and speed up calcium loss. You are also more likely to take a fall when you are drunk, which can lead to fracture. When you lead a sedentary lifestyle, your bones will weaken. The less you use your bones, and sit around doing nothing, the less strong you will be. It is important to try bone strengthening exercises to avoid this disease. Try incorporating 3 hours of low-impact exercise to your week for best results. Many prescription medications can cause bone loss. Make sure to thoroughly check the labels of your medications to make sure this is not a side effect. You can also do additional research online, or ask your doctor. Osteoporosis can really get in the way of your ability to freely move through your days. Simple activities like jogging or even dancing become risky, because your bones can become so brittle when you do not address the issue. The great thing is that your strength can be built back up with some positive lifestyle changes. Navigate below to learn everything about osteoporosis and the different ways to prevent and treat it. The decreased levels of estrogen during menopause makes women more susceptible to bone loss and developing osteoporosis.